There are many ways to explore Wichita’s diverse art scene, from taking part in Final Friday art crawl to visiting an art gallery or art museum or even making art. 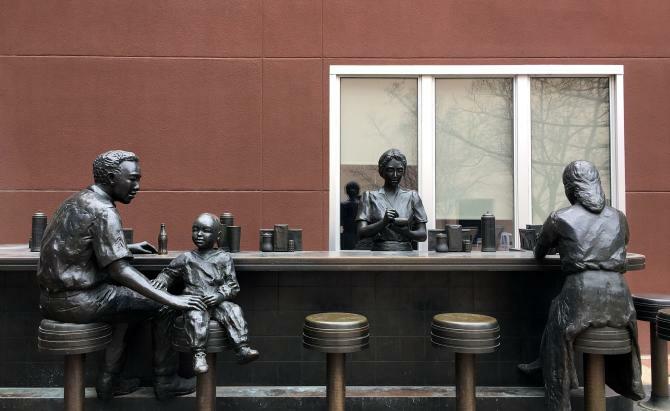 Here’s another way that is free and can last as long as your time allows: check out the public art in Wichita. 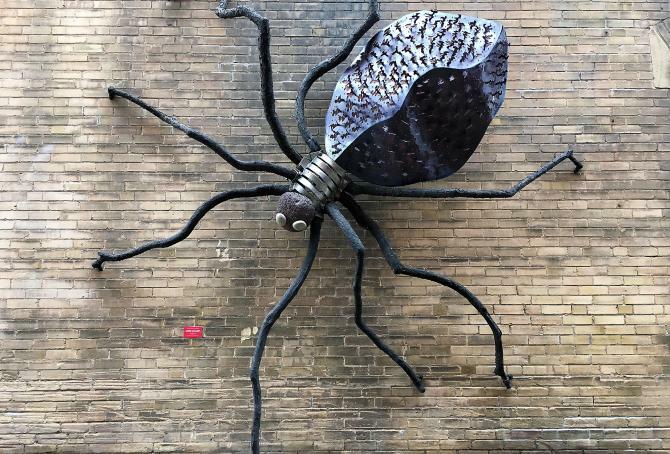 There is simply too much across the city for us to mention every piece of art that is on public display, but we’ll help you get started with this list of some of the most unique Wichita public art installations. 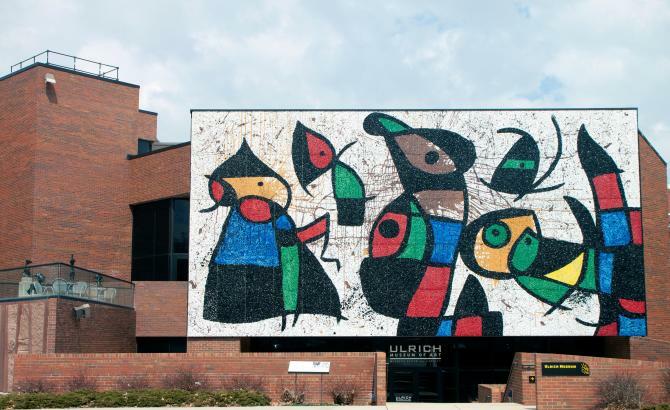 Ulrich Museum of Art at Wichita State University commissioned Spanish surrealist Joan Miró to create a mural to cover the entire facade of the McKnight Art Center in 1978. The Venetian-glass-and-marble mosaic spans 28 x 52 feet and is just as big of an art holding for the city: it was Miró’s only predominately glass mosaic he ever created and it’s the largest of only four Miró murals in the U.S. “Personnages Oiseaux,” which translates to “Bird People,” features big, whimsical shapes in brilliant colors that seem to float on a backdrop of paint splatter. The mural is part of the Ulrich’s nearly 80-piece Martin H. Bush Outdoor Sculpture Collection that is spread across the Wichita State University campus. It has been named a top campus sculpture collection in the country. A new mural painted as part of the Horizontes (“horizons” in Spanish) art-and-community-engagement project in north Wichita is the largest mural in the world painted by a single artist, according to Guinness World Records. It is more than 50,000 square feet and was designed and painted by Colombian street artist GLeo on a grain elevator. The mural features people of color looking toward the horizon, conveying a sense of hopefulness and vibrancy. It is located in the industrial corridor that separates Wichita’s predominantly Latino North End from the historically African-American northeast. In addition to the large-scale mural, Horizontes has commissioned 20 smaller murals in the North End by numerous artists. Any discussion on public art in Kansas has to include the Keeper of the Plains, one of the most photographed works in the state. People come from all over the world to see this dramatic sculpture of a Plains Indian with hands raised in supplication to the Great Spirit. The 5-ton weathered steel piece was donated to Wichita in 1974 by Native American artist Blackbear Bosin, who helped found the adjacent Mid-America All-Indian Center. 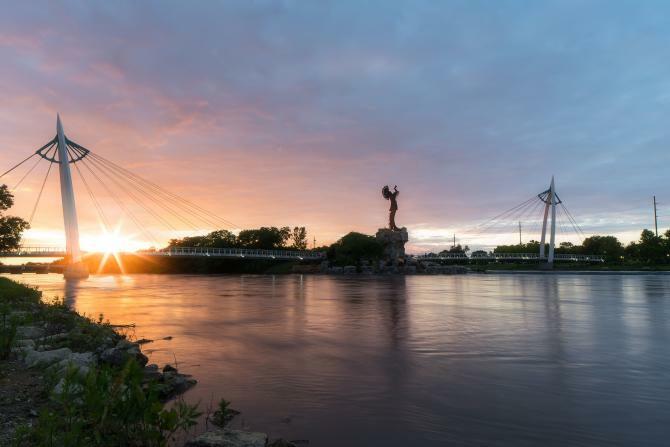 Keeper is 44-foot-tall and sits atop a 30-foot-tall pedestal at the confluence of the Big and Little Arkansas rivers. 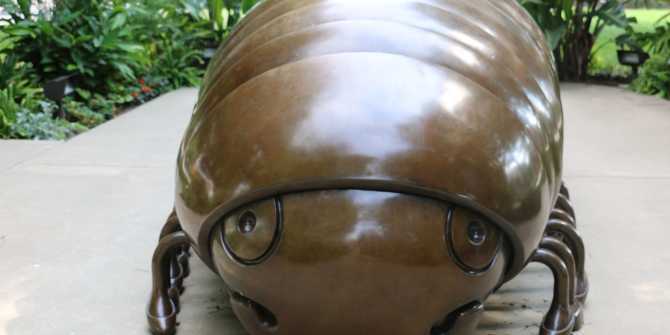 You’ll see 10-foot replicas of our iconic Keeper at various sites around Wichita, forming Keepers on Parade. This public art project organized by Together Wichita paired sponsors with local artists who painted, adorned and transformed the blank fiberglass sculptures into works of art. Visit the Urban Art page on our website to see a list of their locations. 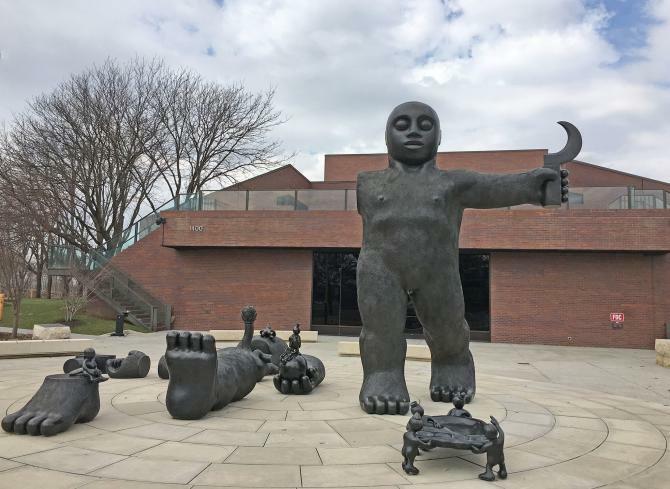 As you approach the Wichita Art Museum, the giant bronze sculpture “Dreamers Awake” doesn’t appear to be the signature style of artist Tom Otterness. After you’ve parked and walked closer to the 15-foot-tall figure, though, you see that the smaller elements around the feet of the standing figure are full of the whimsical cartoon creatures for which Otterness is known. Otterness, who was born in Wichita in 1952 and moved to New York in 1970, is today considered one of America’s most prolific public artists. His “Dreamers Awake” is one of more than a dozen outdoor sculptures in WAM’s Art Garden, free and open to the public 24/7. A beautiful 5-acre meadow in the Sedgwick County Park near the 13th street entrance has been designated the Sedgwick County Art Walk for an interactive sculpture park showcasing environmental art. The project is privately funded and the first installation is a 60-by-40-yard “Turtle Maze” by local artist Tobin Rupe. 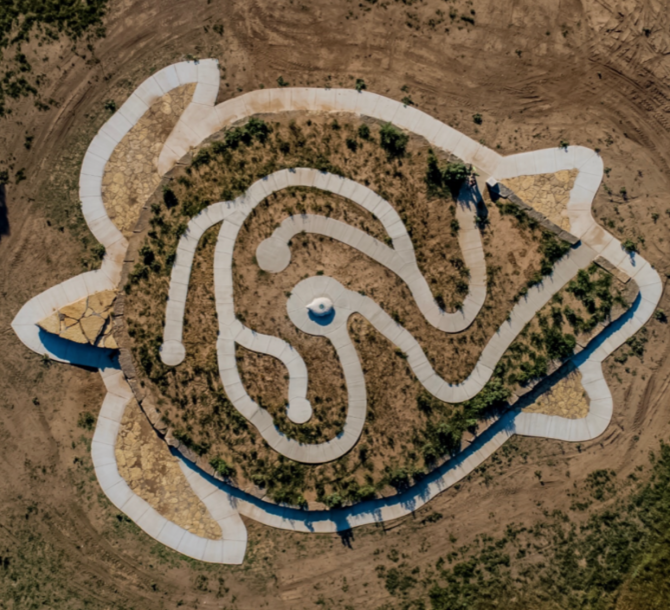 The entire maze is in the shape of a turtle – though that’s easier to see from drone photos or an airplane on approach to the airport – and at the center of the maze is a box turtle carved of stone with the words “A good planet is hard to find” on its shell. The entire piece used nearly 200 tons of stone, including large slabs of Flint Hills limestone. Terry Corbett, an artist who is coordinating the creation of the art walk, said the next of four additional major pieces planned is “Crane Dance,” a large standing stone with a mosaic that should be installed by May 2019. 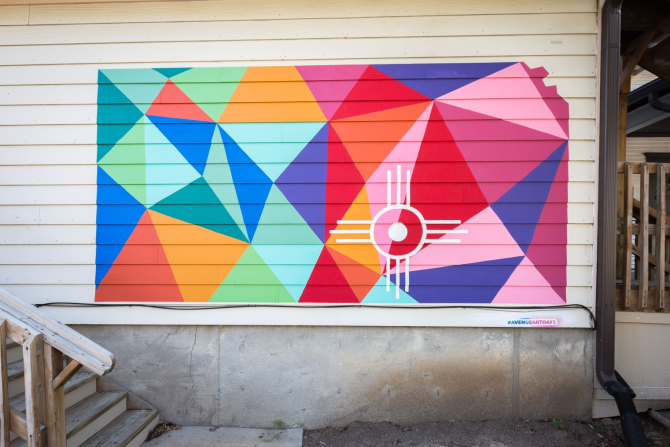 Everyone has a favorite Wichita mural and there are plenty to choose from in the Douglas Design District. We love the geometric shapes and vibrant colors in “A Kansas Gem” as well as the use of the hogan from the city flag to mark Wichita’s location in the state. And, of course, we agree that Wichita is a Kansas gem! This mural on the eastern side of Clifton Square is one of many that are the result of Avenue Arts Days, which has created a large concentration of murals along Douglas Avenue or within a block of Wichita’s central artery. 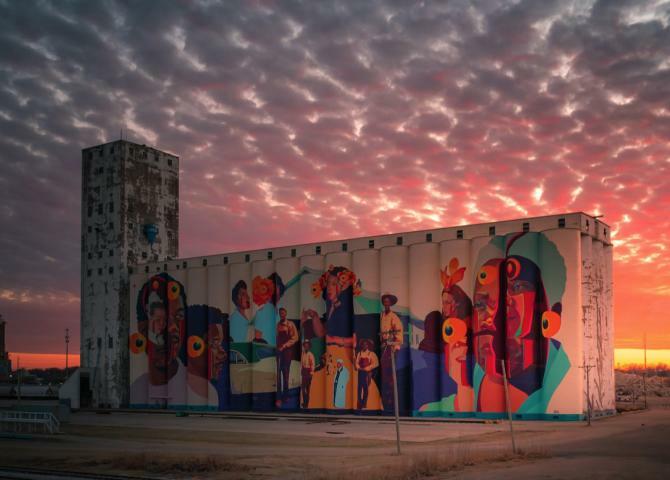 Take a mural tour to see some of Wichita’s other creations. 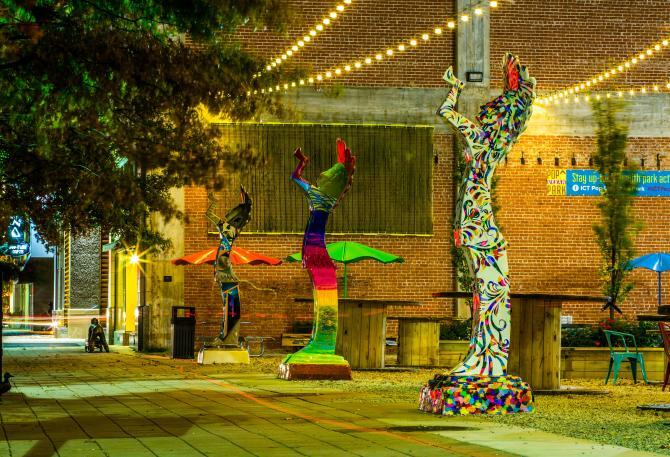 These are just some of the unique art installations around Wichita. Explore more during creative celebrations like Final Friday or taking an arts & culture tour.